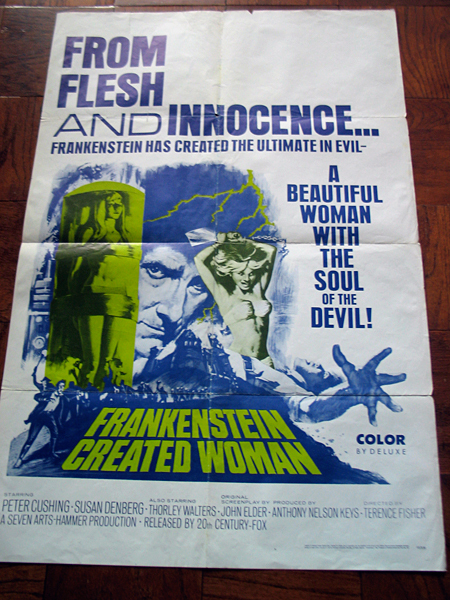 I recently rediscovered some old film posters that I had in storage for over 15 years and one of them was for the Hammer film, Frankenstein Created Woman (1967). I love Hammer’s Frankenstein movies and Frankenstein Created Woman is one of my favorites. The poster was a gift given to me many years ago and I’m planning on getting it framed soon so I can hang it proudly in my new home. I thought it would be fun to share a picture of my Hammer poster that I snapped yesterday. In an odd coincidence Titan has recently released Marcus Hearn’s latest book, The Art of Hammer: The Official Poster Collection From the Archive of Hammer Films, which I just reviewed for the Movie Morlocks. I really admire Hearn’s devotion to Hammer. The author has written three books about the “Studio That Dripped Blood” in recent years, including Hammer Glamour: Classic Images from the Hammer Archives, which I wrote about last year. His latest book is the first collection of Hammer film posters ever published and it’s a real treat for Hammer fans like myself.